A project sponsored by the EU aims to create a blended diesel composed of 20% ethyl levulinate, 70% diesel, 1% special additive, .... to create a cleaner burning diesel that is more sustainable. Such a blended fuel could create an almost immediate impact on the supply side of diesel fuels. Ethyl levulinate (EL) is a novel diesel miscible biofuel (DMB) produced by esterifying ethanol with levulinic acid. The project will also use fast pyrolysis to convert the residue left over from biofuel production to bio-oil for subsequent upgrading to DMB. EL has an oxygen content of 33%; a blend of 20% EL, 70% petroleum diesel and 1% co-additive has a 6.9% oxygen content, resulting in a significantly cleaner burning diesel fuel. The fuel has high lubricity, reduced sulfur content, meets all the ASTM D-975 diesel fuel specifications, and experiences no significant losses in fuel economy, according to Prof. Michael Hayes of the Carbolea Research Group at the University of Limerick in Ireland, the DIBANET co-ordinator. The DIBANET project has received €3.73 million (US$5.5 million) under the Energy Theme of the EU’s Seventh Framework Programme (FP7). In addition to the Carbolea Research Group, the DIBANET consortium comprises partners from Argentina, Brazil, Chile, Denmark, Greece, Hungary and the UK. Optimize the yields of levulinic acid from the conversion of biomass. 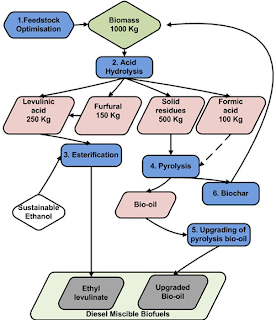 Improve the energy balance and the total biofuel yields possible from a feedstock by sustainably utilizing the residues in pyrolysis processes to produce a bio-oil that will be upgraded to a DMB. Reduce the energy and chemical costs involved in producing ethyl levulinate from levulinic acid and ethanol. Select key biomass feedstocks for conversion to levulinic acid, analyse these, and develop rapid analytical methods that can be used in an online process. Analyze the DMBs produced for their compliance to EN590 requirements and, if non-compliant, suggest means to achieve compliance. The conversion to sustainable liquid fuels will be a slow and incremental process -- at first. It will involve significant mistakes, a gradual accumulation of breakthroughs, significant company turnover, and a few big winners. What is not considered is the potential benefit to local and regional players -- including farmers, ranchers, bankers, entrepreneurs, foresters, and the associated local and regional economies. Biomass is not nearly so energy dense as petroleum, coal, or natural gas. The biomass industry will require a broadly based infrastructure to provide raw biomass, local pre-treatment for initial densification, transportation, regional treatment and processing, etc. Biomass networks will evolve wildly at first, and will be refined by actual market needs. Replacing 50% of Petroleum Content in Plastics?